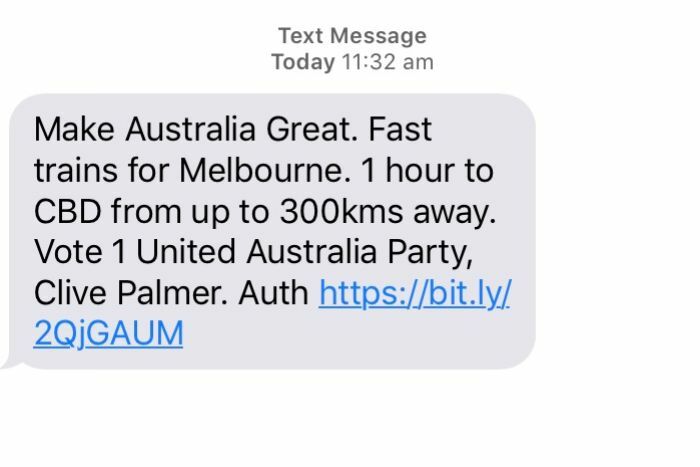 An unknown number of Australians received unsolicited text messages from Clive Palmer’s United Australia Party today, leaving many questioning how he got their number. Mr Palmer is trying to make a political comeback after his short-lived tenure in Federal Parliament between 2013 and 2016. His party did not immediately respond to questions about how the SMS contact list was obtained, but a number of those who opened them said they had “no idea” how it had happened. Tanyia Harrison, who received the message in Melbourne, said it was “completely inappropriate”. Kelly Wong in Adelaide called it a “sneaky and inappropriate use of data”, adding she was also unhappy about the lack of transparency around how her number was gathered in the first place. “I hope this isn’t the kind of thing we’re going to see more of in the upcoming election campaign,” Ms Harrison said. The texts, which offer no clear way to unsubscribe, were geographically targeted across Australia. In South Australia, the message read: “Blackouts wreck our lives. We need affordable, reliable power” along with a link to his website. Despite the online backlash, an Australian Electoral Commission spokesperson said such messages were permitted under the Electoral Act. The incident spotlights the lack of regulation governing how political parties, as well as their contractors, can use the personal information of Australians without clear consent. Their activities are broadly exempt from the Privacy Act, which Australian Privacy Foundation chair David Vaile said led to an “asymmetric” relationship between parties and the Australian public. “The parties can buy any commercial database … they can use anything else they can get their hands on,” he said. The Australian Law Reform Commission recommended the exemption be repealed in 2008. Yet data collection, voter profiling and targeted messages are now synonymous with the modern political campaign. At least one text recipient was on the Do Not Call register, but an Australian Communications and Media Authority spokesperson said non-commercial SMS, such as those about political matters, were generally allowed under the Do Not Call Register Act and the Spam Act. Dr Vaile said the exemption from the Privacy Act enjoyed by political parties was never justified and should be removed. He said the refusal to change the exemption set “a really bad example” for the country when it came to privacy. 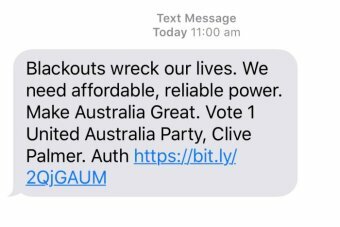 Unsolicited text messages also caused a stir on the day of the 2016 federal election, when SMS messages, purportedly sent by Medicare, claimed Malcolm Turnbull planned to privatise the system. Mr Palmer relaunched his Palmer United Party (PUP) as the United Australia Party (UAP), copying the name of a party that existed before 1945 and installed Joseph Lyons and Robert Menzies as prime ministers. The businessman managed to recruit one parliamentary member to his party, welcoming former One Nation senator Brian Burston to the fold after his spectacular falling out with Pauline Hanson. 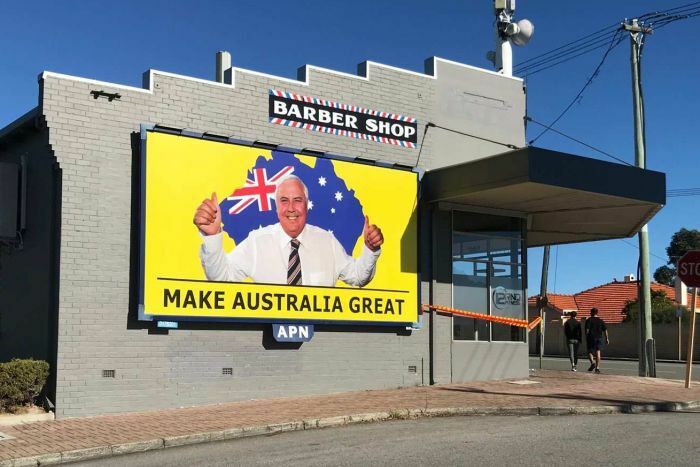 His return to the political sphere has come with controversy, as those hurt by the closure of his Townsville nickel refinery in 2016 criticised him for splashing cash on billboards and advertising campaigns when they remain out of pocket. Mr Palmer has labelled attempts by liquidators to pursue him and others for millions of dollars after the refinery collapse as a “witch-hunt”, arguing he owes nothing. His political advertising has also raised the ire of US rock band Twisted Sister, who claimed he ripped off their song for television commercials — another claim Mr Palmer denies. The UAP did not respond to further request for comment by deadline.